You guys! This has been on my to-do list for like...EVER. Ok really not that long, but really since Hannelore was born. I know these are all over Pinterest, but I still love it. I love how simple it is. I also love rulers. I do not know what it is, but I love them. Actually, ever since I was little I have loved school supplies. Call me weird...I won't care, but I do. I do not ususally like doing all the things everyone else is doing because I feel like it will be "old" sooner if that is the case, but this was an exception for me. I am thrilled with how it turned out. I am so happy and excited to get it hung up. Hannelore loves to count the numbers and measure herself. I remember doing this when I was growing up. We marked up a door jamb in my parents house to measure ourselves. I can't wait to use this for many many years. The steps were super simple. 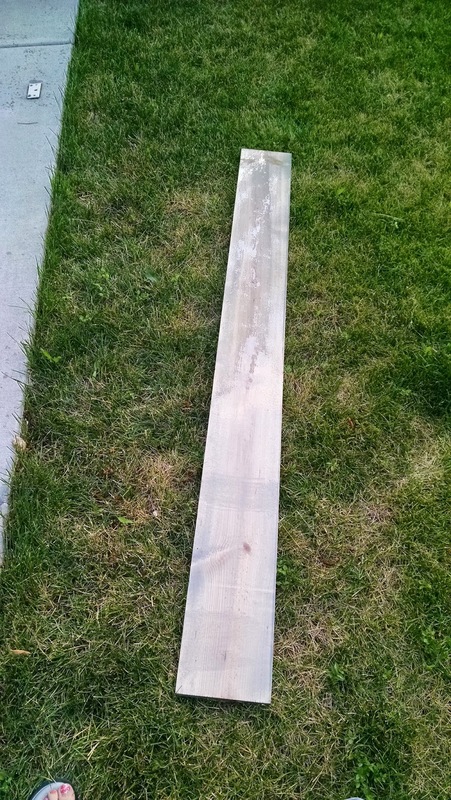 I bought the board, stain, and Polyurethane at Home Depot. The board is a 6 foot 1x8 board. 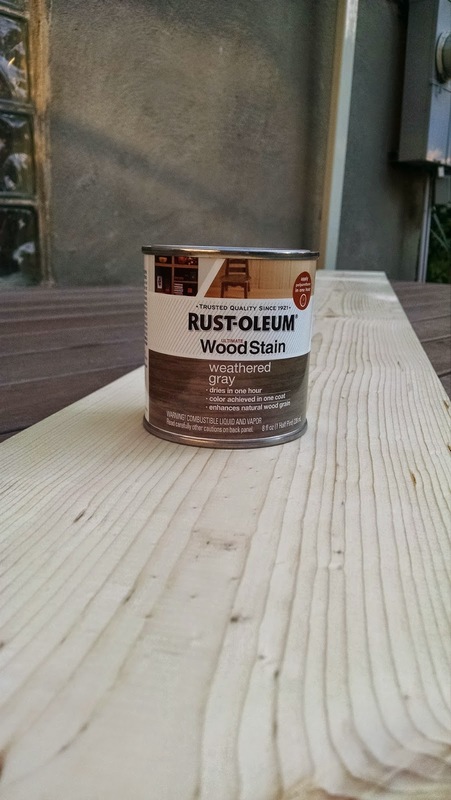 The stain I bought (which I LOVE LOVE LOVE) is Rust-oleum in Weathered Gray. 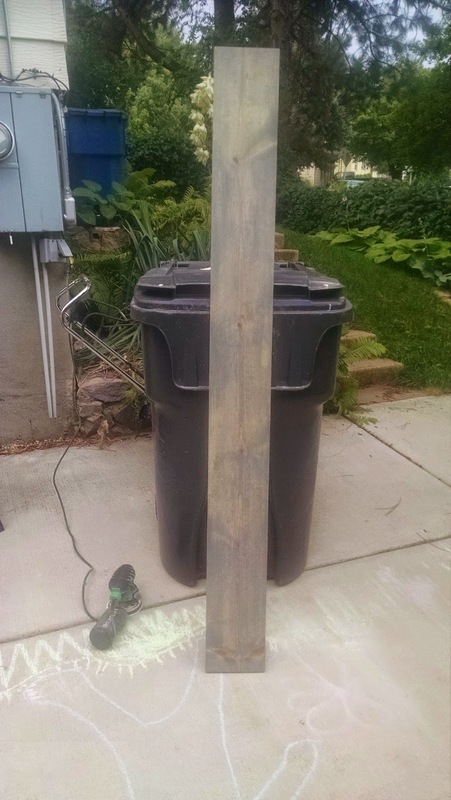 This stain doesn't look like the typical ruler which I wanted originally, but I LOVE this color. So I went with it. 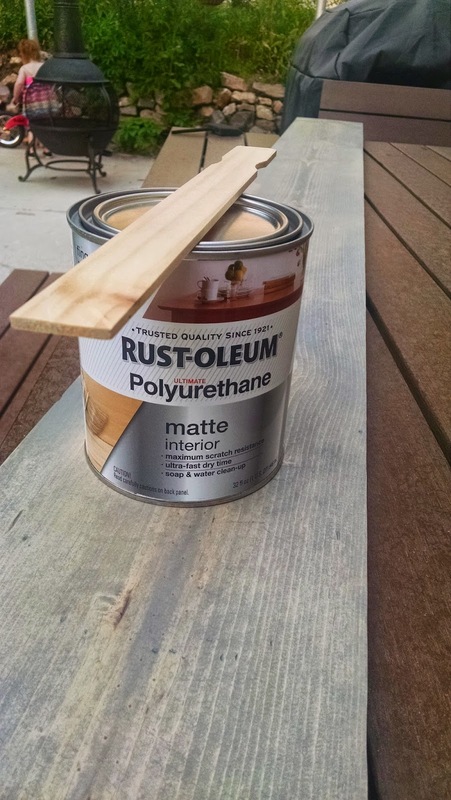 I bought the Rust-oleum Matte Polyurethane. I bought this because I did not want it glossy at all. I did not even want to see it really, but I wanted to put it on so the vinyl would stick well and so the board would be more protected. I have a confession to make. 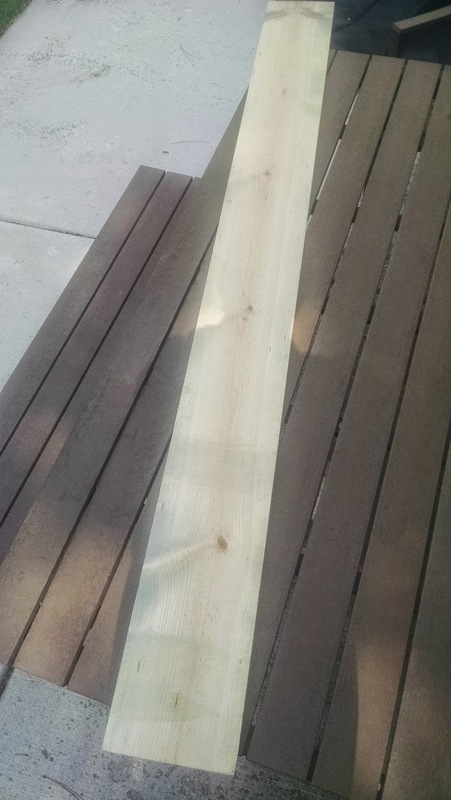 I tried to stain the board without sanding it. DO NOT DO THIS. Complete waste of your time and stain. It will not "take" the stain. See I have pictures to prove it. You can laugh if you want. I know I should have just sanded it first, but... I didn't. So after staining it and then it not taking the color AT ALL. I had a minor meltdown. So I sanded it and then stained it and the color was perfect. I love it. How sad it looked after staining. Ridiculous. This is what it looked like while the stain was sitting on it. Before I sanded it this is not what it looked like. 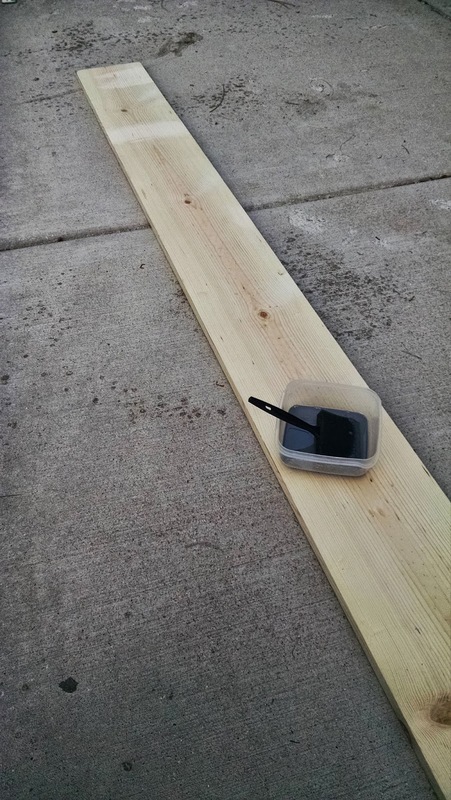 It would puddle and it was not staying on the board and well...staining the wood. I should have known better, but oh well. Right after it was done being stained. Still wet. I honestly only put one coat on. It was smooth enough after that one coat that I was not worried about the vinyl sticking. After letting it dry for 24 hours in my very warm garage I put the vinyl on. I put the 1 foot mark up half a foot on the board. Therefore, when I put it on the wall I will have to place it a half a foot off the floor. This will make the board sit 6 and a half feet up. Since I don't worry at all about her being over 6.5 feet that was good enough for me! I put on dashes every 3 inches and that was great for me. You could do more or less. I pre-marked everything and then also left the measuring tape on the side. It worked wonderfully. Some very easy variations would be to paint the board a color and/or add decorative vinyl of any sort. I went with more of the ruler look so I didn't want anything else on there. That is it. So easy and well I think you know this already, but I love it! My husband wants to do a more intricate one. We will have to see which one we end up keeping if that is the case. If/when that happens I will do a post on it and you can vote for which one you like better. Deal? I have linked up with The Party Bunch, Monday Funday, Much Ado About Monday, Keeping It Simple Crafts, The Crafty Blog Stalker, Inside BruCrew Life, Take-A-Look Tuesday, Too Cute Tuesdays, Show Me What You Got, Look what I made Wed, Hit Me With Your Best Shot, Wow Me Wednesday, Whatever Goes Wednesday, Inspire Me Wednesday, Wow Me Wednesday, Whimsy Wednesday, Show + Tell, Artsy Corner Thursday, The Creative Exchange, Thrifty Thursday Link Party, Creativity Unleashed, Flaunt it Friday, Pinworthy Projects Party, Frugal Friday, Inspiration Gallery Link Party, The Link Party Palooza, The Creative Collection, Linky Party: DIY Inspired, Super Saturday, The Yuck Stops Here and Think Pink Sunday! My husband made one not too long ago. Wish he would have seen this. He didn't use stencils, which adds a great finished touch. Great job! you did such a great job!! i've seen these around pinterest and was meaning to make it if we ever have kids. Wow, this looks amazing!! I love that you did it in such a classic, simple style. This is a really great idea. And you did such a great job walking us through how to make it! That is really cute and what's not to love about it? I think it's a genius idea and it could last multiple children. That's something I want to start when we move to our new home! Awesome! I wish I had seen your tutorial before I purchased the ruler for my nursery. I love it! I did make some wooden baby blocks though (and posted the tutorial on my blog) so at least my craftiness is on display somewhere in my nursery. Love this! I think this is such a great idea to chronical a child's growth in such a cute way. This is so fantastic! I will have to make one for my son too! This is such a fun idea. You did a great job! This is adorable! I'm about as UN-crafty as it gets, but I love this idea. May have to try it once we start having little ones! Oh my gosh this is so cute! My parents would always measure us against the door frame but this is adorable! I shall definitely remember this when I come to have my own kids! Thanks Ananda! It was a lot of fun. Now I need to get it hung up and start using it! I am a perfectionist. So I had to use the vinyl. I'm sure yours looks fantastic! You are too kind! I promise it was simple! Do it! Kids like to measure themselves. For some reason it is really fun for them! Thank you! Yeah I pinned a similar one before I had my daughter and it has been on my to do list every since. Thank you! That is what I was going for. So hopefully I will still love the design in years from now. That means a lot. Sometimes I feel like I am all over the place with my tutorials. Yes! Chalkboard paint would be a fantastic idea! I want to use it with multiple children. So I am glad I came up with something that would be gender neutral! I saw the wooden baby blocks! I love them! So cute! I plan to make some very soon! I am following your blog. It is so cute! Can't wait to keep up on all you are doing! Yay! I hope he does it and has fun! That is what I was looking for. I love it! Yay! Do! My daughter loves it. It is really simple. It has been on my to do list for ages too! I promise it is a very fast project. The most time consuming parts is for drying time. You can do it! I promise! I have always wanted to make one of these, they are so cute! 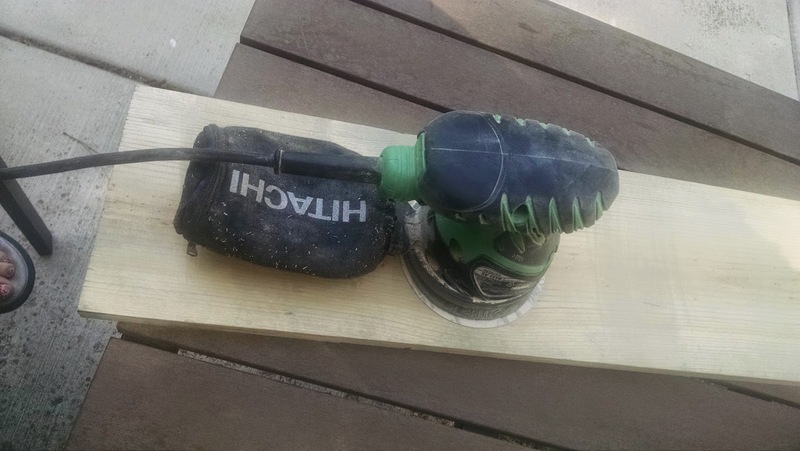 Thanks for the DIY! Yeah I still need to get mine up. My daughter daughter tries to measure herself at least daily. I'm so glad I found your blog. I love it! I started following you! Can't wait to keep up to date on all your great ideas! Your so welcome! It was super easy and simple! What a great project. It looks great. This is perfect! I remember writing our heights on our door jam at my grandma's because we moved our house a few times. This is easily transportable! That is actually a very good point. I was thinking solely about how it is cuter than just writing on a door jam, but it is very portable so you won't have to leave those memories behind! This idea would be perfect for my nieces room! I'll have to share this with my sister in law! Please do! It is so quick and a fun touch! Thanks it was so fun! Still need to get it hung up though! Love this idea! I shared it today on my Roundup post from the Creative Exchange Link Party. Thanks so much for stopping by! Thank you for sharing it on your round up! That means a lot to me. I love your link up party! Linked up this week! Thanks for the weekly link up! Where did you get the vinyl numbers and line? 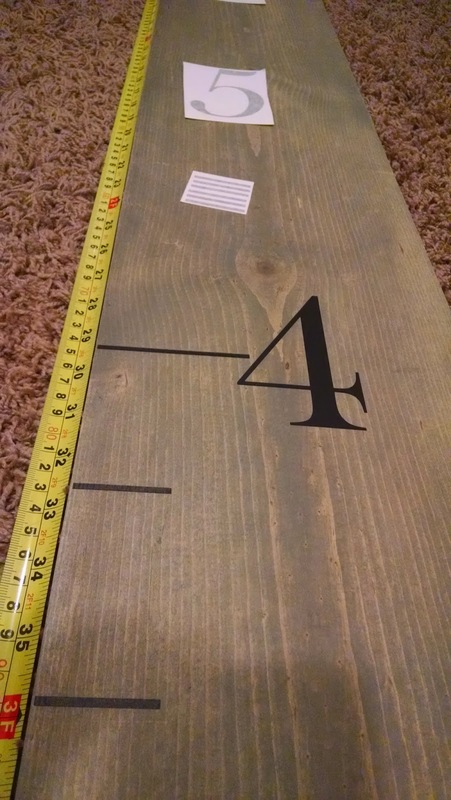 I got mine here (http://www.u-createcrafts.com/diy-ruler-growth-chart/), but she doesn't offer them anymore. 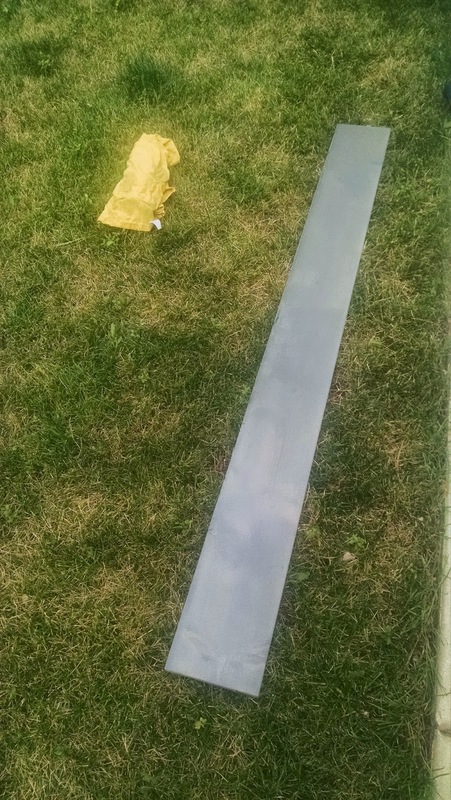 However, I found this one (http://amzn.to/1xujMRl) and it seems MUCH easier to apply than the one I bought because they come in 12 inch sections. 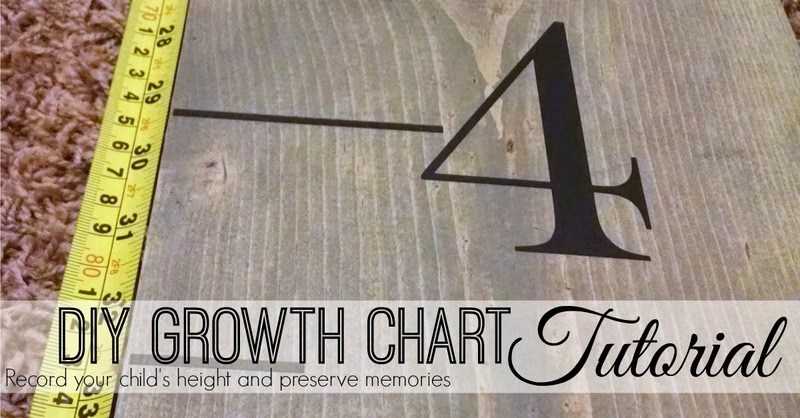 I also found this one too (https://www.etsy.com/listing/151204073/vinyl-growth-chart-inch-markings-and) and that seems easy to apply too.